Sometime ago Brian and I went to Oven and Shaker, a restaurant here in Portland owned by Cathy Whims, who also owns Nostrana. We were headed to see Tool, you read that right, and I wanted good pizza. 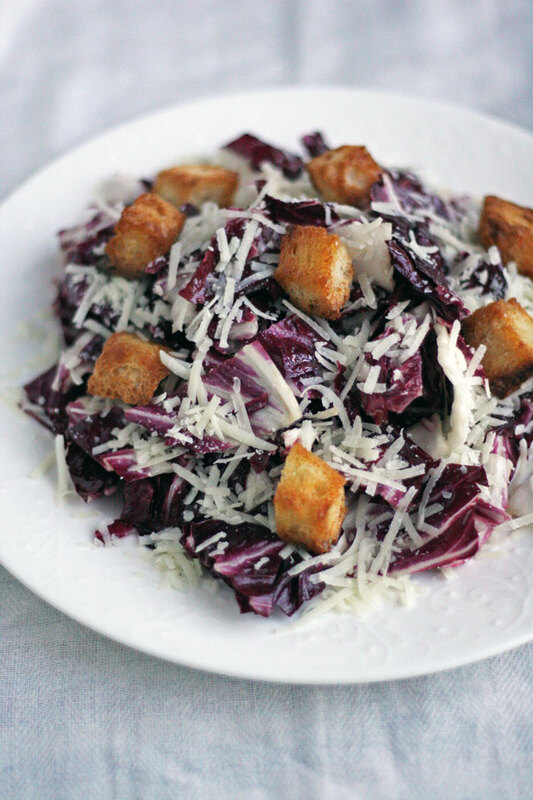 Plus I had never had her famous Caesar Salad using radicchio. I took one bite and I was super hooked, no joke hooked. I crave it a lot. And I am not in that area often enough to run down and order it, so I made it at home. I had the pleasure of meeting Cathy at Diane Morgan’s writing workshop, she is a sweet lovely person. And she makes amazing food, which makes her sweeter. Oddly enough I looked around for her recipe before I actually would email her for it, but I remembered Diane shared it in one of her cookbooks. It is a very well known famous salad, everyone loves it! It is perfectly acidic, crunchy, savory, and has a nice hint of but not overpowering anchovy paste. Perfectly salty from the mound of parmigiano-reggiano cheese, the best croutons I have ever eaten, and oh so good. So without further ado, please make this, it is worth every moment of your time. Note: Soaking the radicchio in ice cold water for an hour makes it crunchy and less bitter. Cathy Whims recipe from Diane Morgan’s the Christmas table cookbook. 1. Tear the radicchio leaves into bite sized pieces and soak in ice cold water in fridge for an hour. Drain the radicchio and place in a salad spinner, or in a kitchen towel. Get as dry as possible. 2. To make the dressing, place the olive oil, vinegar, mayonnaise, egg yolk, anchovy paste, garlic, sugar, salt and pepper in a jar and shake until combined. You can also use a blender, or a bowl and whisk. This can be made a few days in advance, store in fridge in an airtight jar. 1. Place the bread cubes on a baking sheet, and bake for 8-10 minutes or until golden brown. Remove from pan, add to a bowl. 2. In a small saute pan, add the butter. Once melted, add the rosemary and sage. Cook until fragrant, about 2 minutes. Remove from heat and pour over bread cubes, toss to combine. These can be made one day in advance, and stored in an airtight container, at room temperature. To serve, give the dressing a shake, or mix. 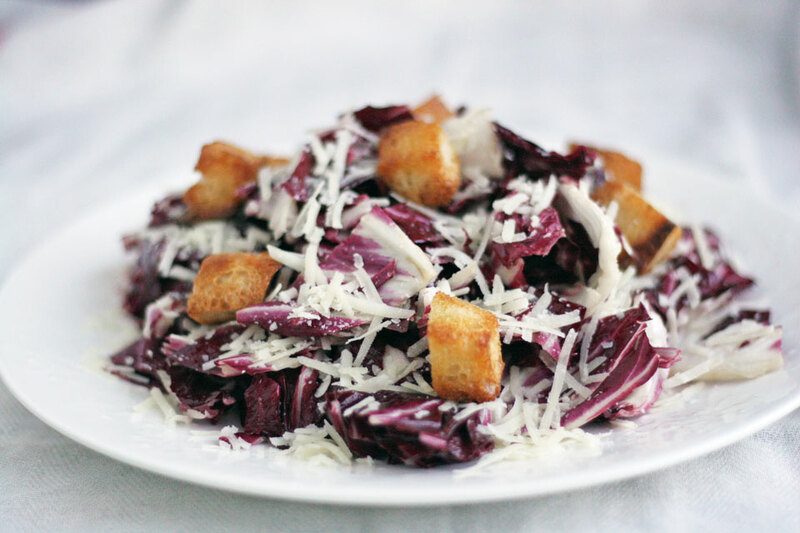 In a large bowl, toss the radicchio and dressing together, combine well. Add the parm, toss to combine. Add the croutons to the top. Serve immediately. Note: This salad is best served fresh, not leftovers. Thank you for sharing your recipe, it is the best!!! !